Mozart: Symphonies Nos. 40 & 41 - "Jupiter"
Mahler: Symphony No.1 in D "The Titan"
Gershwin: Rhapsody In Blue; Prelude For Piano No. 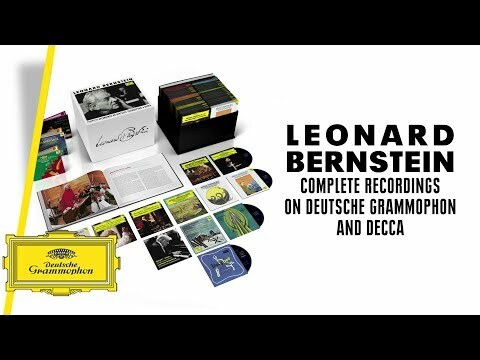 2 / Bernstein: Symphonic Dances From "West Side Story"
Leonard Bernstein was born in Lawrence, Massachusetts. He took piano lessons as a boy and attended the Garrison and Boston Latin Schools. At Harvard University, he studied with Walter Piston, Edward Burlingame-Hill, and A. Tillman Merritt, among others. Before graduating in 1939, he made an unofficial conducting debut with his own incidental music to "The Birds," and directed and performed in Marc Blitzstein's "The Cradle Will Rock." Then at the Curtis Institute of Music in Philadelphia, he studied piano with Isabella Vengerova, conducting with Fritz Reiner, and orchestration with Randall Thompson. Bernstein traveled the world as a conductor. Immediately after World War II, in 1946, he conducted in London and at the International Music Festival in Prague. In 1947 he conducted in Tel Aviv, beginning a relationship with Israel that lasted until his death. In 1953, Bernstein was the first American to conduct opera at the Teatro alla Scala in Milan: Cherubini's "Medea" with Maria Callas.